Just In: Buhari, Osinbajo in secret meeting with former VP, Sambo – Royal Times of Nigeria. President Muhammadu Buhari and Vice President, Yemi Osinbajo are currently holding a closed-door meeting with former Vice President, Namadi Sambo. 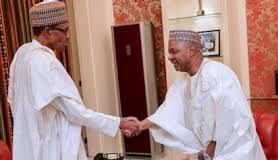 The meeting is being held at the Presidential Villa in Abuja.